According to "National Geographic," upwards of 80 different species of parrot fish exist. These fish grow up to 4 feet long and travel in schools in ocean waters. Parrot fish play an important role in coral reef production and upkeep. Female parrot fish release thousands of eggs into the ocean for males to come and fertilize. The fertilized eggs attach to plankton and, once hatched, swim around coral in search of algae to eat. Offspring are typically born as females, and some change to males as they grow older. Juvenile populations are threatened by pollution, habitat loss and dredging. Parrot fish live, on average, 7 to 10 years. 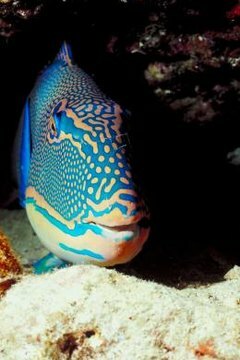 As parrot fish age, they change colors and patterns multiple times. Adult parrot fish populations are affected by threats such as habitat decline and fishing.